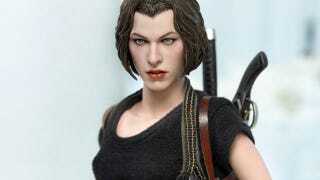 Milla Jovovich, star of the Resident Evil series of films, is now the star of an exquisite Resident Evil action figure, with Hong Kong company Hot Toys recreating her in this 28cm piece. Available later this year, and typical of Hot Toys' style, it comes with a ton of accessories, like extra outfits, extra hands, extra weapons and even two hair styles to choose from. Sadly, as is also Hot Toys' style, the likeness is a little off, though the amount of detail on hand (and the fact the face was sculpted by hand, and not a computer) more than make up for it.